Tourists gather together from around the world on two well-known dates “October 22nd & February 22nd” to witness the magnificence Sun Festival that is held in Abu Simbel Temples yearly by booking a splendid cruise throughout Nile cruise holidays. These two temples were built in the 13th century through the 19th century. Ramesses II wanted to commemorate his victory in the battle of Kadesh So what is so special about Abu Simbel temples, its history, and how did the process of Abu Simbel relocation?? The temple of Abu Simbel was built during the reign of Ramesses II and the temple is actually two separate temples through which king Ramesses II wanted to immortalize his love to his most beloved wife “Nefertari”. The great temple of Ramesses II is dedicated to Amun, Ra-Horakhty, and Ptah and is a well-preserved temple in which Ramesses II decided to prepare a terrific celebration inside in two different dates; February 22nd the date of reaching the throne and October 22nd his birthday. In such a festival, you will find three of Ramesses’ statues are lighted with the sun rays except for the fourth statue of Ptah, who was the dark god. The smaller temple was dedicated to Hathor & Nefertari. Abu Simbel temple was discovered in 1813 after being buried under the sands of the desert for a long time. After the construction of the High Dam, the Nile water level in this area continued to rise dangerously, which was a serious threat to the Nubia area, especially the location of the Abu Simbel temples. It was the UNESCO mission to join the Egyptian forces with an international team from Italy, Germany, Sweden, and other countries to launch a project to Abu Simbel relocation process in 1963 and the mission was successfully accomplished in 1968. The relocation mission coasted about $40 million and the effort of the international collaboration aimed to protect & save the world biggest historical monument. 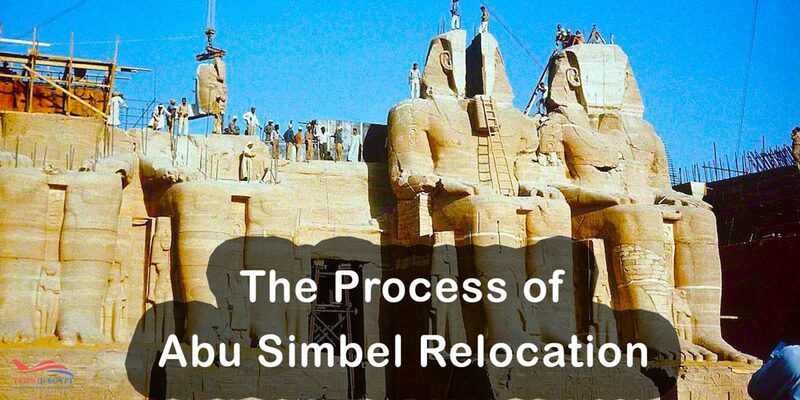 Abu Simbel relocation process was complex and involved many details as there was no place for any mistakes or lack of planning. The water of the High Dam would have eventually flooded the temples of Abu Simbel and there must be accurate procedures to save them. In order to save the temples of Abu Simbel as a primary solution, a cofferdam was built around Abu Simbel Temples to protect them from the rising water of the High Dam. This cofferdam was 370m wide and was made of steel sheets. The government built drainage & a pumping station to prevent water from reaching the temples. The excavation process started with extracting the walls & ceilings of the temples from inside the mountain and to protect them, they were all covered with sand fills to protect the temple’s parts from any debris then a tunnel was dug for workers so that workers can enter and get out of the tunnel in an easy way. The roof of the temple was supported by steel scaffolding & rubber sheets to protect the inscribed blocks through the cutting process. Engineers ensured workers used only the electric jack until they reached a depth of 80cm. workers were so careful in cutting & rebuilding the 807 blocks of the great temple and the 235 blocks of the smaller one. Re-erecting the roofs & the walls of the temple was the second step in Abu Simbel relocation process. They built two domes to cover the structure of the temple that is considered a very clever idea. The dome measured 17 m in depth and its foundation was 22 m high, the dome, which was built is considered the strongest dome in the world as it can carry the weight of the artificial hill. Then the statues of Ramesses II were cut, filled with chemical materials in addition to powder mixed with the fine dust of the cutting blocks to give the same color. The intricate calculations to achieve the original solar-alignment remains the most impressive thing about the salvage project. This matter is similar to what ancient engineers were able to achieve to occur twice a year to illuminate the face of Ramesses II. Visiting Abu Simbel temple with our majestic Egypt tour packages is a life-changing experience through which you’ll find yourself in one of the most important ancient achievements, know everything about the dedication of the Egyptian Pharaohs to their gods, their work, and their social life and surely you’ll be a lucky person if you got the chance to witness the magical Sun Festival.